This is the most beloved of all the Psalms and probably the most familiar passage in the Old Testament. We often consider it as it is, but today let’s look at it through the lens of.Christian faith, especially thinking about the New Testament event of the angels giving the good news of Jesus’ birth to the shepherds of Bethlehem. that are highlighted in this Psalm. The providence of God is like the care that the shepherds have to be sure that the sheep do not go hungry, and do not go thirsty. The sheep are not finding the green pastures and still waters on their own. The Lord leads them there. We also want to point out that the shepherds knew the right paths for their sheep. Places where they could walk without fear. Even the darkest places. Just think how comforting it would have been for the Bethlehem shepherds to know just what kind of compassion and attention God provided-the same as they did. The prepared table shows planning and anticipation. The shepherds would not have wanted to leave anything to chance. They would have wanted the sheep to have what the needed when it was time. The overwhelming sense of the Psalm is that they do not need to worry, but trust in the Lord. What would you say the “job description” of a good shepherd would include? If you were a shepherd, what things about this Psalm would you like best? Does this Psalm say that there will be no enemies or hard times? What is the Shepherd’s role when enemies are around and when hard times come? What are the benefits of being one of the sheep of the Lord’s flock? 8 And there were shepherds living out in the fields nearby, keeping watch over their flocks at night. 9 An angel of the Lord appeared to them, and the glory of the Lord shone around them, and they were terrified. 10 But the angel said to them, “Do not be afraid. I bring you good news that will cause great joy for all the people. 11 Today in the town of David a Savior has been born to you; he is the Messiah, the Lord. 12 This will be a sign to you: You will find a baby wrapped in cloths and lying in a manger.” 13 Suddenly a great company of the heavenly host appeared with the angel, praising God and saying, 14 “Glory to God in the highest heaven, and on earth peace to those on whom his favor rests.” 15 When the angels had left them and gone into heaven, the shepherds said to one another, “Let’s go to Bethlehem and see this thing that has happened, which the Lord has told us about.” 16 So they hurried off and found Mary and Joseph, and the baby, who was lying in the manger. 17 When they had seen him, they spread the word concerning what had been told them about this child, 18 and all who heard it were amazed at what the shepherds said to them. 19 But Mary treasured up all these things and pondered them in her heart. 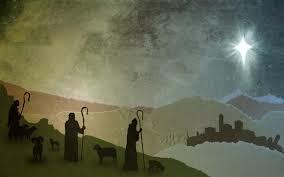 Today, let’s focus on the shepherds and their roles in the Christmas story. Their first role was caring for the sheep. Watching over them. Making sure they were safe and secure. This took skill, time, effort and attention. You could not have been a sloppy or distracted shepherd very long, because your sheep would have been neglected and fallen prey to all kinds of dangers. Watching and waiting is a good thing, when you are a shepherd. The second role was to pay attention. To listen to what the angels told them. It would have been very hard not to pay attention, with something so remarkable and out of the ordinary happening right before their eyes. Even so, we sense that they were good, active listeners, so that they not only heard what the angels said, they also took it to heart. Third, the shepherds talked it over among themselves. We may miss this if we hurry through the passage. They said to one another, “Let us go now to Bethlehem and see this thing that has taken place, which the Lord has made known to us.” There was conversion, and consensus, before they acted. Next, they went. They acted on what the angels said and on their own resolve. They put the experience into action. Once there, they told their story. They realized they were the only ones who COULD tell the story. And-as they did – people were amazed – and Mary treasured and pondered all they said. How are we like the shepherds? Has God done something good in our lives? If so, please give some examples. Are we to do something with that, something that might be like what the shepherds did? Who will it help, and how, if we do tell the story? What if we don’t? Where are the places and how will you tell “your Christmas Story” this year?